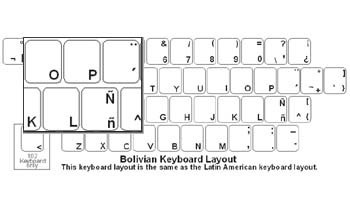 The DataCal Bolivian (Spanish) language keyboard labels are a high-quality, durable and economical solution for creating a Bolivian (Spanish) bilingual keyboard. This label set supports the Spanish language in the following countries: Argentina, Bolivia (Spanish), Chile,Colombia, Costa Rica, DominicanRepublic, Ecuador(Spanish), ElSalvador, Guatemala, Honduras, Mexico, Nicaragua, Panama, Paraguay, Peru(Spanish), PuertoRico, Uruguay,and Venezuela.The label set also supports Quechua in: Bolivia, Ecuador,and Peru. The label set also supports K'iche (Guatemala).